$6.8 Million Monroe Park Renovations Continue Despite Controversy | News and Features | Style Weekly - Richmond, VA local news, arts, and events. 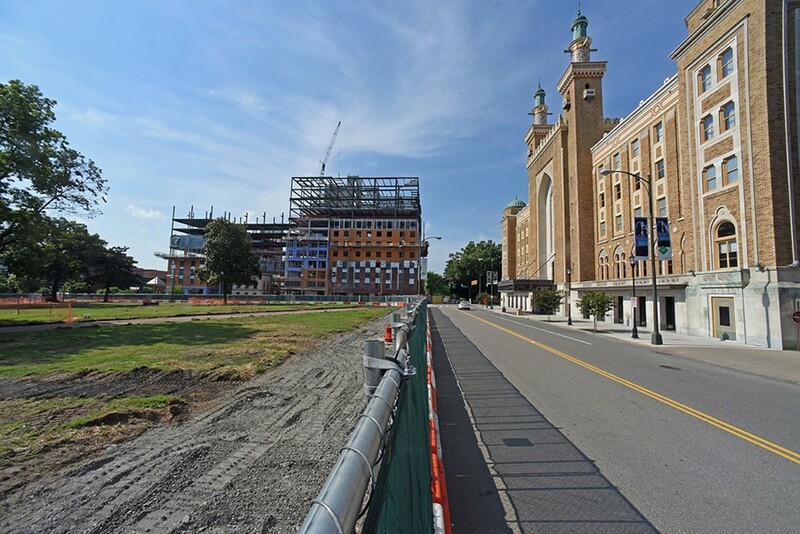 Renovations continue at Monroe Park next to the Altria Theater and new dorm construction at Virginia Commonwealth University. It costs $9,855 to make part of a public park private for three weeks, according to a Department of Parks, Recreation and Community Facilities bill for the rental of Monroe Park. SMG Richmond, the management company that oversees Altria Theater and Dominion Arts Center, rented the park on behalf of Capital One from May 8 to May 31 for that amount. The bank hosted its annual associates’ event for hundreds of employees and erected tents on the southwest corner of the park. The tiny price tag is one of many concerns touted by a small but dedicated group of Oregon Hill residents fighting against renovations in Monroe Park, as well as the Monroe Park Conservancy that will oversee the park post-renovation. At an Urban Design Committee meeting last week, a group of three pushed back on everything from public toilet placement to the aesthetics of the planned Laurel Street event space. “This is processed cheese food to me, this pavilion,” said Todd Woodson. The committee recommended ordinances concerning the furnishings, the toilet and the event space — a patio and pavilion facing Altria Theater — for approval by Planning Commission, with slight tweaks. But it also recommended the conservancy move faster to develop an operations management plan for the park. The committee wanted a plan to specify rental rules — to avoid “excessive tenting,” as one committee member called it. A plan would set rental fee structures and codify liability for damages. Monroe Park Conservancy President Alice Massie says it’s too soon to have a specific fee structure before renovations are complete, adding that the board and the city were working on the operations management plan. After the renovations are complete, she says, revenue from park rental will go to the conservancy to help maintain and improve the historic space. This year, though, the parks department received the rental money for the Capital One event. The department’s pricing website lists $750-$875 per day for park events. With two days prorated for set-up and breakdown, that would mean over $16,000 in revenue. Charles Pool questioned whether it was a “sweetheart deal” between SMG and the department. Deborah Morton, the director of the department, says they are charging full rate. Only days when events take place at the tent are charged the full $750, she says. Otherwise, it’s $15 an hour for days the tents are sitting vacant — “reserved use” of the park, rather than an event. Park renovations have faced pushback from the start. Advocates for the homeless fear that services such as food and clothing giveaways will not be allowed post-construction. And in May the Richmond Free Press reported that city administrators had quietly shifted $833,569 more to the $6 million project, despite telling City Council it was fully funded in December. Renovations are expected to be complete in spring of 2018.